If you have friends who are German shepherd owners, they will tell you that their dogs can easily go through a bag of food in a week. This is because they eat a lot and they would eat almost anything. They need to be watched as often as possible. Full grown dogs can weigh as much as 100 pounds. When it comes to German shepherd pups, getting their nutrition right is key to a healthy and happy life. The best time to feed him a high quality, nutritious food is from birth to four months. Because his growth is most rapid during these four months. Protein which promotes strong muscles, tissue and organ growth. Minerals and Vitamins which provide a base for cellular level health. Carbohydrates which provide energy and also make him feel full. Protein is extremely important and according to experts, it accounts for up to 50% in dry body weight of canines. So it is crucial to the growth and development of your German shepherd puppy. The best sources of protein are from other animal sources, such as chicken, beef and so on. Carbohydrates are so important to your German shepherd puppy’s diet since it provides energy and it does so by creating glucose. Whole grain carb products provide a slower release of fiber and it necessary for an increase in probiotic bacteria. Your German shepherd puppy needs fat because it is where he gets a ton of energy. Aside from fats provided by carbs and protein, he needs other fats in his diet such as omega 3 fatty acids and other essential acids. Vitamins are also vital for proper cellular development. Minerals affect the growth of teeth and bones. According to experts, your German shepherd puppy does not the ability to create minerals and vitamins in his body, so it must come from a food source. Bear in mind that it is also not a great move to feed your dog vitamin and mineral supplements as you put them at risk. This may cause poisoning. Perusing the dog food aisle in your favorite supermarket will reveal a series of dog food packages. You will notice that they all have pictures of smiling dogs. However, most of these different types of packages are just the same or similar product that is just packaged differently. It is very important that you actually read the ingredient list when purchasing German shepherd puppy food. Lots of dog foods sold in supermarkets are packed with fillers, which is basically useless but edible ingredients put in the dog food to make it more filling for your puppy. However, the problem with this is that your puppy doesn’t need these fillers and it will simply cause him to poop twice as much as the amount you feed him. The best pet food can be found at online stores and specialty stores. If you read the ingredient list on packages bought from these places, you will notice that you can, in fact, recognize most of the ingredients on the list. Some ingredients may even be processed or grown organically. Choosing the best food for German shepherd puppies may not be easy, but it worth it. You will notice that your German shepherd puppy is thriving on the correct dog food. You may also be spending less time at a vet as a happy and healthy German shepherd puppy doesn’t get sick so often. Then there is also the dilemma of whether to feed your German shepherd puppy dry or wet puppy food. The following reviews on the best German shepherd puppy food recommendations should help you make up your mind. Royal Canin German Shepherd Food is tailored made for German shepherd puppies. The texture, size and shape and formula of the kibble make it ideal for German shepherd puppies. Since the digestion in German shepherd puppies is not optimally developed during the first few months of life, they need food that helps their digestive system along. The Royal Canin German Shepherd Puppy Food contains all sorts of nutrients like LIP protein that supports good digestive functioning and a good intestinal system, which ultimately leads to a good quality of stools. It also considers the sensitivity of the digestive system. The Royal Canin German Shepherd Dog Food supports healthy joints and bones, by giving your puppy his required daily intake of phosphorus and calcium. This is especially important since German shepherds are more at risk of developing hip dysplasia than any other breed. This formula can also prevent and reduce joint inflammation in aging dogs. Since your German shepherd puppy’s defense system is not fully developed in his puppy stages, he would benefit from the antioxidants in the Royal Canin German Shepherd Puppy Food. 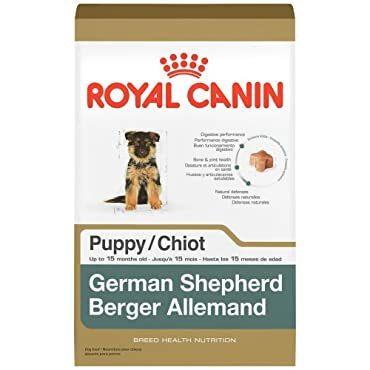 This formula is designed for pure breed German shepherd puppies and contains 100% balanced nutrition for your German shepherd puppy from 2 months to 1 year and 3 months months of age. 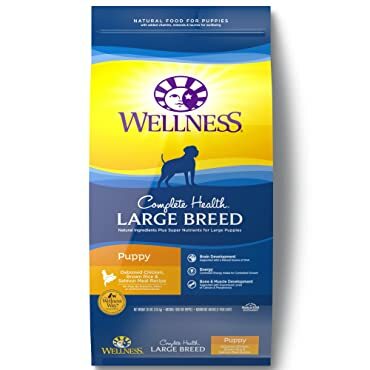 Wellness Complete Health Natural Dry Dog Food is specially designed for larger dog breeds such as the German shepherd puppy breed. It contains carefully selected ingredients to provide a complete and balanced meal for your German shepherd puppy. The ingredients within the food are delicious and your puppy will thoroughly enjoy meal time. Some of the benefits that are provided by this nutrient rich formula are strengthened teeth and bones, healthy cognitive development, optimal nutrient absorption, vitality and energy, strong muscle development and overall health. Your German shepherd puppy has a longer growth cycle than other breeds. In addition to that, he also has a faster potential growth rate due to the physical makeup of his body, so his nutritional needs will vary compared to other smaller breed dogs. This formula is designed to meet the nutritional requirements of this large breed of dog, by introducing nutrient-rich whole foods to your German shepherd puppy’s diet. So what you basically get from this dog food is a complete and balanced diet that needs to be supplemented with nothing else but water, controlled energy intake that helps to pace his growth and enough calcium and phosphorus to aid support healthy bone and teeth growth. In addition to this, the eye and brain are further developed with the help of the DHA fatty acids. This formula also provides your German shepherd puppy with the fat that he requires to develop properly, while at the same time controlling calories. You will be pleased to know that this product does not contain soy, wheat, and meat by-products, corn, artificial colors, flavors, and preservatives. It is also made in the USA and backed by the wellness guarantee. According to modern science, your German shepherd puppy is simply an adaptation of the wolf. It is more or less a domesticated wolf, so years of domestication and proper nutrition has turned your potential foe into a lifelong best friend. It is important that you give your German shepherd puppy proper nutrition since he is growing and his body will require it. You should never underestimate bad nutrition and feeding your puppy the wrong food during his first few months of life, unfortunately, cannot be reversed. Taste of the wild grain free puppy food offers a blend of protein sources to make this formula mouthwatering. It contains a combination of fruits and vegetables to provide the much need antioxidants your German shepherd puppy needs. This grain free formula gives your dog digestible energy and excellent nutrition. Also, contains fish protein sources for added taste and flavor. Customers that have been feeding their German shepherd puppies this formula for a few weeks have noticed healthier and shinier coats and fewer visits to the vets because of illness. So the meat and fish protein sources seem to work really well in providing the nutrition a German shepherd puppy needs. 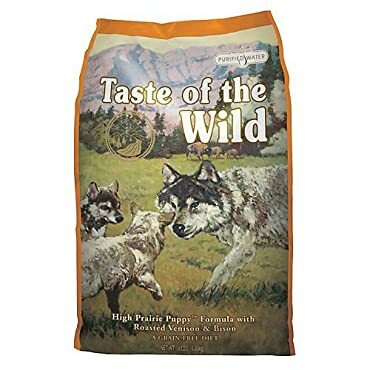 Since Taste of the wild grain free puppy food does not contain the filler that other store bought puppy food has, you only require half the amount at feeding time. However, although the portion at mealtime is cut in half, your German shepherd puppy will still be getting twice as much nutrition from this formula. This is because everything contained in the Taste of the wild grain free puppy food is vital and needed by your puppy’s body. Since puppies are a work in progress, it is never too early or late to get them started on the right nutrition. The Solid Gold Holistic Dry Dog Food contains high-density protein, I grass fed lamb, a unique blend of 20 nutrient rich super foods and healthy whole grains. Some of the ingredients contained in this dry dog food are cranberries, carrots, pumpkin, blueberries, almond oil, kelp, broccoli, and lentils. The lamb contains in this formula gives it a great taste and high-density protein for your German shepherd puppy. The ingredients that provide the coat and skin health are canola and salmon oil and monounsaturated fats such as olive oil. It is potato free and does not contain any soy, corn or wheat which most dogs are allergic to. The egg protein provides your dog with the vitamins, minerals and essential amino acids that he needs for muscle growth and regulation of metabolism. The low fat and calories content makes this dry kibble suitable for dogs with a weight problem. 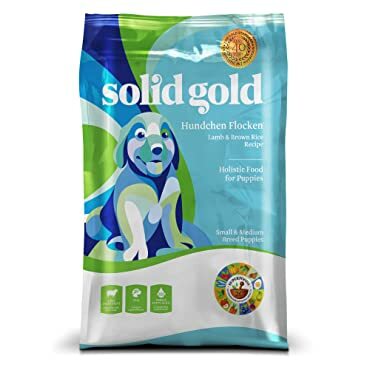 So if your dog is overweight or a bit over his recommended weight for his age, you should try switching him to Solid Gold Holistic Dry Dog Food and see if he loses any weight. According to most customers, dogs love the Solid Gold Holistic Dry Dog Food. It still tastes great and although it contains a minimum amount of fat, it still has a great flavor and taste to it, unlike other low fat and calorie dog foods that have a cardboard texture and probably taste as well. Initially, when switching your German shepherd puppy over to Solid Gold Holistic Dry Dog Food from any other dog food, you will notice that his stools will be runnier and less consistent. This should only last for a few days, after which his stools should return to normal and usually means that he has adjusted to this dry dog food. There are literally hundreds of different dog food brands out there. With such a wide variety to choose from, making the right choice can prove to be daunting at first. However, with proper research and customer reviews provided by other pet owners who are sincere about helping people choose the best dog food, you can make the best choice for your German shepherd puppy. Always take into consideration the unique genetic make- up of your German shepherd puppy and feed him accordingly. Remember that his breed is more susceptible to hip dysplasia and so you need to feed him dog food that has nutrients that will strengthen his joints and reduce inflammation where possible. Whether or not you want to feed him dry dog food is up to you. The main thing to take into consideration is the fact that the food must contain all the essential, vitamins, minerals and nutrients that he needs. So basically it needs to be a 100% balanced meal and all you need to do is supplement his diet with water and the odd treat. Best Dog Food for Pitbulls – What To Know Before You Buy!